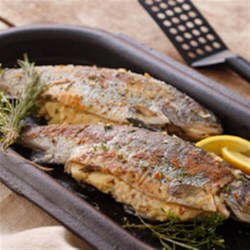 "Applewood Smoked Bacon Mashed Stuffed Trout evokes the flavors of camping, whether the trout are pulled from a stream or fresh from the local market, made over a fire, hot off the grill or served right from the oven." Divide the dry packet of Applewood Smoked Bacon Flavored Mashed Potatoes in half. Using half of the dry mashed, lightly dust both sides of the trout. Prepare the remaining half of the potatoes using one cup of hot water. Stuff the trout with the prepared mashed potatoes. Add pepper and sprinkle with herbs. On stove top, add a little olive oil to a cast iron skillet and bring to medium high heat. Sear the trout on both sides, about one minute per side. Turn off the heat and place the skillet in the oven. Continue cooking the trout for 10-12 minutes or until trout is opaque and flakey. See how to make a spicy no-bake dip with a delicious secret ingredient. first trial for all four of us of trout, it turned out really good! We made homemade mashed potatos and used breadcrumbs.